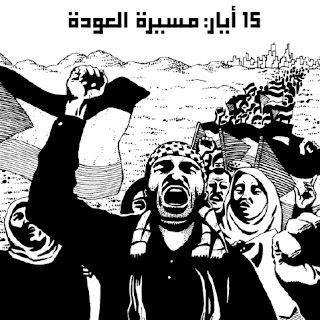 I have been promising myself to write about the preparations for the May 15 Return to Palestine march. I feel the urge to do so because what is going on is a major departure from the classical political activism in Lebanon and I am sure in the Arab World as well. This is a new type of action in which we can clearly see the impacts of the Arab Spring. But I want first of all to say a few words about the Arab Spring -or Revolutions, or Uprisings, call them as you please-. The situation is now far more complex than when it started in Tunisia in late 2010. And this should be expected. When a change of such magnitude takes place, you can safely predict that the all the powers will deploy in order to capture as much as they can from the new state of affairs and steer it towards their interests. The Arab Spring was led by people, the People, al jamaheer as we say in Arabic, and it took everyone by surprise. But this was only temporary, and as early as mid-January, we saw a rapid and systematic positioning of the key players seeking to exploit the popular movement in order to preserve and protect their stakes and ameliorate their position. In this process, new partnerships have emerged, new affinities were discovered and new connections established. The Libyan quagmire is a classic example, where the opposition forces have been driven to calling onto the US to come and do as it pleases. This imbalanced "alliance" is happening regardless of the make-up of this opposition which includes groups that should be anathema to the US but with which the US seeks (imposes?) an opportunistic and asymetrical partnership. The news of the killing of Usama Bin Laden today in Pakistan comes to remind us of a similar situation that started in Afghanistan many decades ago. But this should not mean that we have misgivings about the Arab Springs. All it means is that we have to brace ourselves and prepare for a rough ride before we can achieve our goal of a human society based on justice and equity and social cohesion and not on power imbalances and monetary interests. People who endorse these premises have sparked the Arab Revolutions, seeking dignity and equality and an end to humiliation at the hands of dictators and of their business partners. This is exactly why we should, now more than ever, prepare ourselves for the times that are coming. It is time to unearth Gramsci's "The old world is dying away and the new world struggles to come forth: now is the time of monsters" and to act in consequence. We should be ready to fight the monsters with our newly discovered powers. For this we need to educate ourselves, to reach out across classes and borders and to establish strong and effective linkages and partnerships with similar struggles all around the world. We need to build on the successes of the Arab Revolutions but not become complacent about them. What has happened in Tunisia and Egypt is only a beginning and needs to be transformed. As in rugby, we have scored a try now we need to attempt a conversion by kicking the ball into the goal. And there will be plenty of tackling and mauling and scrums in the process. The Return to Palestine March of May 15 gives a good idea of the new tools we have at our disposal. It is a massive peaceful march organized simultaneously in Palestine and in the countries bordering it (I think Syria will pass this time given the circumstances) and in many cities in the world. There is one main slogan: "The people wants to return to Palestine", clearly inspired and aligned with the Arab Spring. The organizers do not hide their affiliation with the Arab Spring, and this has given rise to interesting debates around Syria's official participation. In Lebanon, there will also be one flag, the Palestinian flag, under which all Palestinian factions will assemble. Fath, Hamas, and all the others are organizing together, not as parties but as civil society organizations and with them Lebanese civil society and individuals. The dynamics in the meetings is extremely positive, and this was the case even before the Fath-Hamas reconciliation in Cairo (again the Arab Spring). There is insistence on the peaceful but massive nature of the civilian march, on the right of return to all of Palestine and on the Arab identity of Palestine. It does truly feel as if there is a broadening of the liberation discourse to accommodate new approaches and strategies which were effective in Egypt and Tunisia. Among these approaches in the increased reliance on electronic media. The March has a blog (www.returntopalestine.blogspot.com) with links to the internet sites of the other marches and other activist groups involved in the march, a Facebook page http://www.facebook.com/ReturnToPalestine.Lebanon and a twitter account "may15filasteen". The use of Facebook created an issue that is interesting and worthy of mention. A few weeks ago, Facebook blocked the Third Intifada page following complaints by Zionists. Nothing surprising there. But what is interesting is that now all the pages of the Return to Palestine March have become extra careful in wording their statements and in moderating wall posts and other comments lest they get censored. So Facebook, which has monopolized social media (as there does not appear to be any alternatives that will allow networking between large groups of people who do not know each others), has effectively become a controller of words and thoughts. It can now decide what can and cannot be posted, and what can or cannot be promoted. This is a tremendous power, as the criteria for rejecting and accepting are subjective, lack transparency, and are determined by a private corporation (Facebook) that has financial interests to protect. For example, Facebook has recently acquired the Israeli startup company Snaptu. One attempt to create an individually controlled open source social networking platform is diaspora.alpha. The project was inspired by Eben Moglen's critique of Facebook.